Congressional conservatives who repeatedly tried to kill Clean Air Act climate regulations during the Obama administration are now embracing one. Republicans on both sides of Capitol Hill have lavished praise on the Affordable Clean Energy rule — the Trump administration's proposed scaled-back replacement for the Clean Power Plan — since it was rolled out last week. In a Washington Examiner op-ed Monday, House Majority Whip Steve Scalise (R-La.) hailed the end of the "war on coal" and called the proposed ACE rule "another welcome addition to President Trump's list of promises fulfilled." But for years, Scalise and other congressional Republicans tried to kill or curtail EPA's authority to regulate greenhouse gases in the first place. While those efforts appear to be on standby for now, some conservatives haven't given up the idea of revisiting the issue. EPA's authority "is still unclear, and anything we can do to provide greater clarity of what their role is, we should," Sen. James Lankford (R-Okla.) said yesterday. "I mean, EPA has a very important role in what we're doing, but it lacks clarity." The ACE rule would set guidelines for states to curb emissions by strictly focusing on efficiency improvements at individual power plants, the kind of "inside the fence line" approach that industry groups have long called for. That's a major departure from the gridwide approach to climate regulation the Obama administration took with the CPP. At the same time, ACE would not address the endangerment finding, EPA's 2009 ruling that greenhouse gases pose a threat to public health. Without axing the endangerment finding, EPA said in a set of talking points that it has a "responsibility to fill the void" with a curtailed power plant emissions regulation, rather than repealing the Clean Power Plan outright. Republicans have used various channels to argue over the years that the Clean Air Act does not allow EPA to regulate greenhouse gases and that Congress has the ultimate authority on the issue. Senate Energy and Natural Resources Chairwoman Lisa Murkowski (R-Alaska) attempted to nix the endangerment finding using the Congressional Review Act in 2010, but she was shot down by a Democratic Senate. At the time, she argued that the finding was an effort by EPA to push Congress to pass a climate bill (E&E News PM, June 10, 2010). Since the Obama administration announced the final CPP in 2015, Republicans have looked both to stand-alone legislation and appropriations riders to either kill the endangerment finding or prevent EPA from using key climate measurements to shape its regulations. Lankford last year authored legislation with Rep. Evan Jenkins (R-W.Va.) and others to ban the federal government from considering the social cost of carbon, the metric used to determine the long-term economic impacts of carbon emissions. Similar language was tacked onto the House-passed Interior-EPA spending bill last month (E&E Daily, July 19). Another proposed amendment to that bill, from Rep. Paul Gosar (R-Ariz.), would have barred EPA from using funds to implement the endangerment finding, though it was never approved for floor consideration. But with the proposed ACE rule, those kinds of efforts may start to fade on Capitol Hill, said Frank Maisano, a partner in Bracewell LLP's Policy Resolution Group, which represents a mix of energy clients. "There's always going to be a core group of conservatives and think tank conservatives who think it would be better to do away with the endangerment finding," Maisano said. "I think that number dwindles when you have this rule in place, only because now there is a viable, different alternative to that option." For now, some seem content with the proposed alternative, especially with Republicans eager to tout a win for the Trump administration ahead of the midterm election. In response to specific questions about continued legislative efforts to toss the endangerment finding and the agency's ability to regulate climate-altering air pollution, a Scalise spokeswoman said the majority whip "is very supportive of the president's effort to roll back the CPP" and replace it with the ACE proposal. "The CPP was an ill-conceived and illegal one-size-fit-all regulation that served primarily to eliminate certain types of energy sources — all to the detriment of American families, workers and consumers," she said after linking to Scalise's op-ed. There remains a sense among some conservatives that Congress will have to act in the long term. Senate Environment and Public Works Chairman John Barrasso (R-Wyo.) said yesterday that his committee — and the Senate as a whole — would be unlikely to address the endangerment finding or greenhouse gas regulations anytime soon. He ticked off a list of other priorities on the Senate calendar, including confirming judges and pushing through the stalled water infrastructure bill. But Barrasso suggested he's still interested in revisiting EPA's authority to regulate greenhouse gases under the Clean Air Act. "I still think it's an issue," he told E&E News. 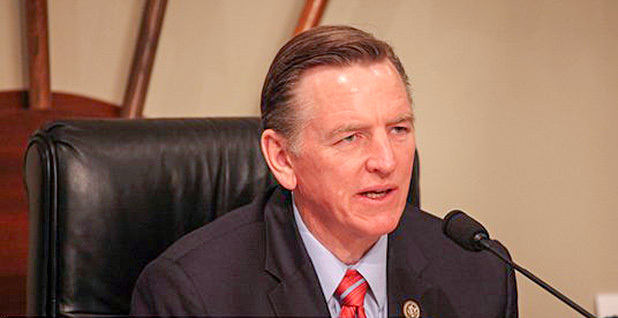 Gosar, too, said he wants to continue to press the issue on Capitol Hill. Through a spokesman, he said the ACE proposal "is as reasonable as the existent regulatory and judicial environment will allow, and so I applaud it." But Congress retains the power to legislatively negate the endangerment finding, he added, and "should consider doing so as a matter of good governance, given the implausibility of the idea that Congress imagined or anticipated the Clean Air Act would ever apply to carbon emissions." With the proposed ACE rule on the table, "what you might get is a few hortatory items, encouraging the Agency to go in certain directions," GOP energy lobbyist Mike McKenna said in an email. But EPA will eventually need some longer-term clarity, McKenna said. "I think the argument that regulation of greenhouse gases is going to eventually require congressional involvement is pretty much without serious argument," he said. "Agencies usually are hesitant to do anything too aggressive outside of statutory boundaries, and that is especially the case where the cost of the action will be apparent to everyone (like a regime involving GHGs would be)." Sen. Jim Inhofe (R-Okla.), the Senate's pre-eminent climate skeptic, said almost as soon as the ACE rule was proposed that he would prefer to ax the endangerment finding (E&E Daily, Aug. 22). He added yesterday that he's been fighting the endangerment finding since it was finalized under the Obama administration. Inhofe took issue with EPA's use of science from the Intergovernmental Panel on Climate Change, which he said was "totally discredited" after the 2009 "Climategate" email controversy. "I've always felt from that time that it should be revisited," he said. "And, of course, it would take legislation." Democrats, meanwhile, continue to rhetorically fight the proposed ACE rule, but it's not clear they'll have much power to stop it from moving forward. Sen. Michael Bennet (D-Colo.) said on the floor last week that the CPP rollback ultimately highlights the need for congressional action on climate change. "If we're serious about climate, we need an enduring solution," he said. "We can't have something that's ripped out like the Clean Power Plan after a year and a half. That will not fulfill the responsibility we have for the next generation of Americans, or to the planet, for that matter." EPW ranking member Tom Carper (D-Del.) added yesterday that he would like his panel to take a closer look at EPA's replacement proposal, though he said he hadn't yet spoken to Barrasso about potentially scheduling a hearing. "I think this is a situation which begs for a hearing or two and a chance to bring in folks who can talk about what the administration has laid out," Carper said. "We have, on our side, very serious reservations."